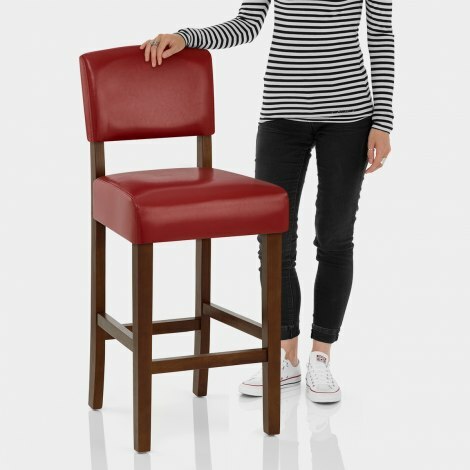 The Sydney Walnut Bar Stool Red is designed to add a burst of classic character to any room. Ideal for anybody who seeks tasteful furniture with a difference, the Sydney Walnut Bar Stool is well and truly one of a kind with its bold and contrasting style. Ample padding ensures great support, whilst a red bonded real leather seat and backrest pad combine comfort with a unique kind of glamour. Four divine walnut legs come together to form a rich frame. With strong and sturdy bracing bars, these strengthen not just its structure but its classic look too. Ideally suited to most surfaces, protective floor plugs provide a useful finishing touch and help minimise marks to flooring. "Product was excellent quality... Many thanks"
We are thrilled, the stools look great! Proper quality .. everyone really pleased. They look great, solid and exactly as we’d hoped from the picture. Fantastic service and so speedy. Thanks! Lovely bar stools, extremely comfortable and good quality. Add a great flash of colour to our kitchen. Very pleased! 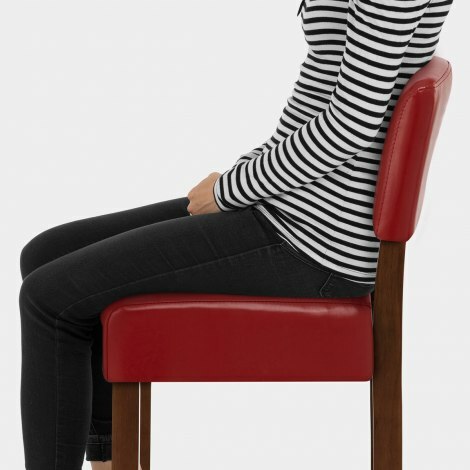 Received this stool today and Wow it is absolutely gorgeous, the colour is a lovely ruby red and the leather is so soft. I have now ordered another 2 to finish off my kitchen. The bar stools look good and are solid. Easy to fit together. We liked them so much we ordered an additional one. These sturdy stools look stunning in my kitchen and they are just what I wanted. The dispatch and delivery time was exceptionally quick. Well done !